As defined by the work published by the Millennium Ecosystem Assessment, ecosystem services are the benefits drawn from an ecosystem by mankind. These services result from the natural functioning of ecosystems. Mankind therefore benefits from them freely, without having to work for them, provided these ecosystems remain in good health and are able to function properly. What benefits can be drawn from wetlands? Wetlands play an important role in the regulation of a catchment area’s hydrography. Acting like a sponge, high altitude wetlands such as pools, peatlands and ponds absorb some of the rain from the top of the catchment areas. By reducing the amount of runoff water that ends up in the rivers, these wetlands can often help prevent a rise in water levels. Despite this mechanism, streams sometimes burst their banks during exceptional weather conditions. In such cases, the water floods the alluvial plains on either side of the rivers. Excess rain water seeps through slowly, leaving behind the sediments swept along by the runoff water. Acclaimed by mankind for their fertility and proximity to water, most of these alluvial valleys have now been turned into farmland, urban areas or industrial zones. Their streams were diked up to avoid overflow issues and to protect infrastructures. During extreme weather conditions, streams overflow despite these dikes and cause considerable human and material loss. Moreover, the alluvial plains – now disconnected from their streams – no longer benefit from regular sediment input. The water no longer overflows, and the suspended sediments are rejected into the sea instead of seeping into the plains. In the same way as they are able to absorb part of the excess rain water, wetlands are also able to return this excess water during dry periods. The hydrographic network is therefore never completely dried up. Moreover, a large number of wetlands are connected to ground water and thus ensure that groundwater tables are replenished. During storms, coastal wetlands act as a shield that protects man-made buildings set up along the coastline from the aggressive sea. Overseas, this role is mostly assigned to mangroves. The complex interlacing of roots and stems reduces the speed and height of the waves, thus protecting the coast from eroding. 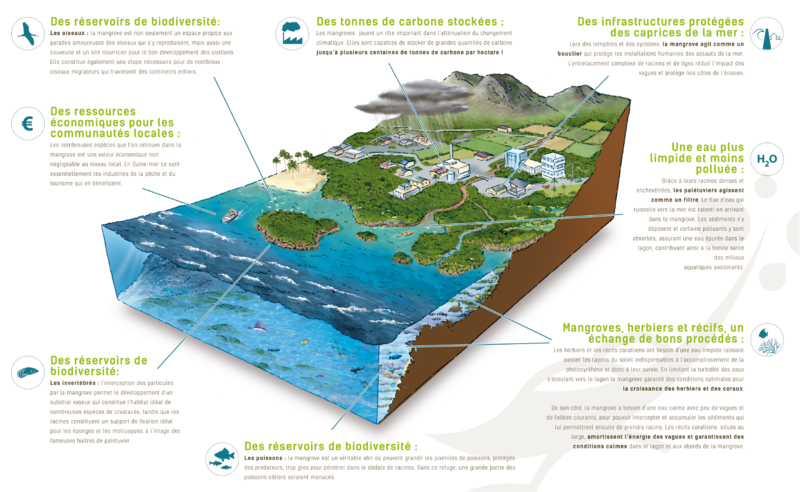 The disappearance of mangroves in certain coastal areas therefore creates a risk for seaside infrastructures, that are first in line for destruction. 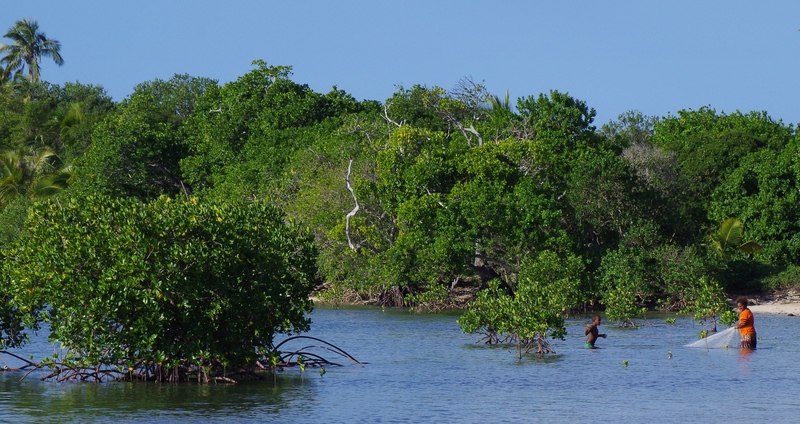 Natural causes can lead to the disappearance of mangroves, like in French Guiana, where the amount of mangroves evolves according to how much sediment is carried out from the Amazon. This cyclic phenomenon is impressive. In just a few months, the mangroves can move forward or back by several yards, thus threatening man-made buildings. Wetlands are located in the lowest parts of the landscape. Quite naturally, streams and runoff water converge towards this precise area. On its way, the water picks up sediments and pollution. Once the hydrographic network reaches a wetland – such as a mangrove – the latter acts as a filter. The water flow is slowed down by the tangled mangrove roots and the sediments remain trapped, gradually creating the substrate for future mangroves, whilst at the same time ensuring the pond’s water stays clear. To a certain extent, wetlands are also able to absorb polluting agents. Fertilizers and pesticides are mostly used in farmlands, and heavy metals and hydrocarbons are generally associated with urban and industrial areas. Many wetland plants are able to absorb some of these polluting agents, whereas others remain trapped in the soil. Nevertheless, it is important to highlight that this ability is limited compared to our pollution production capacity. Mangroves, seagrass beds and coral reefs: like-for-like! Seagrass beds and coral reefs require clear water: it lets the sun rays through, which they need for their photosynthesis, crucial for their survival. 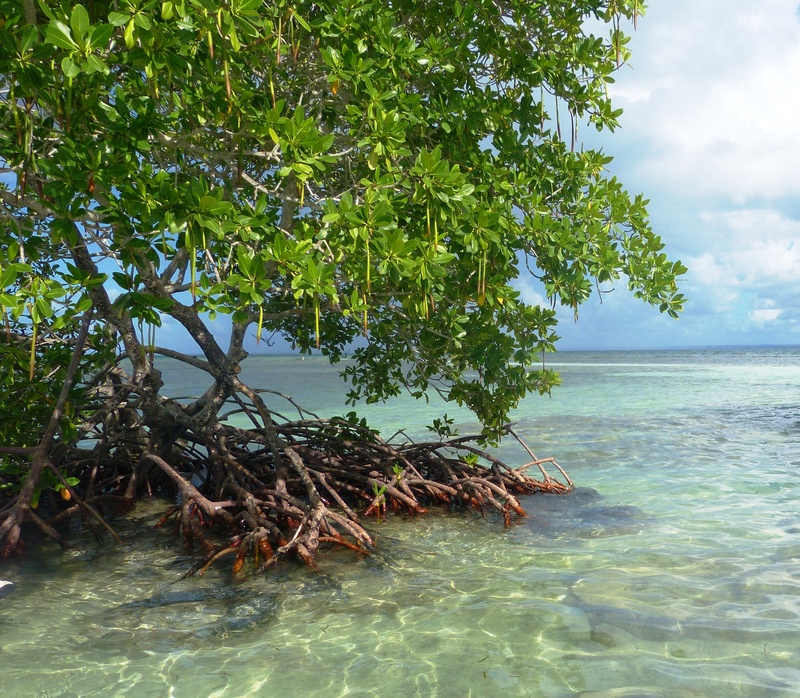 By intercepting the earth’s particles, mangrove roots limit the turbidity of all water coming from the lagoon, and ensure optimal conditions for seagrass bed and coral growth. 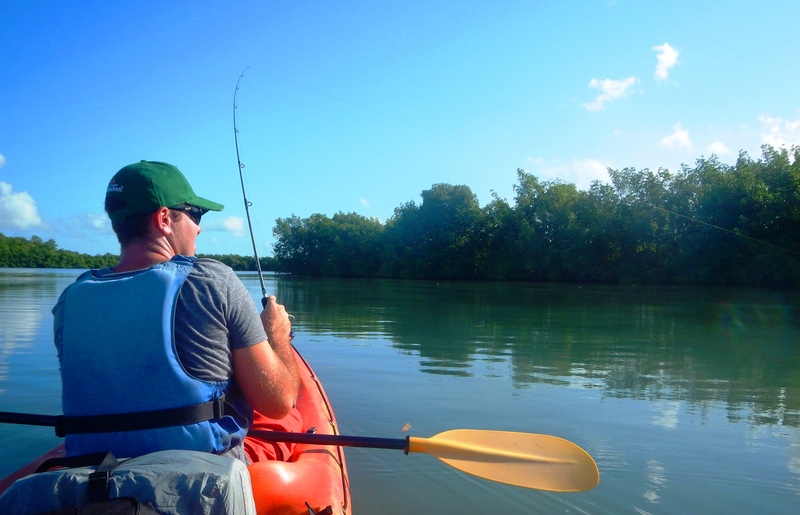 In turn, mangroves need tranquil water with only very few waves and weak currents, to intercept and accumulate the sediments which will then enable them to take root. Coral reefs, located far out at sea, dampen the waves’ force and ensure tranquil conditions in the lagoon and all around the mangrove. Nitrates and phosphates are mainly contained in fertilizers and untreated domestic wastewater. In aquatic environments, they fertilize the lagoon’s water, in the same way as they fertilize crops on land. If there is too much of them, micro-algae can proliferate and consume all the oxygen contained in the water, causing all surrounding living organisms to suffocate. By absorbing some of these polluting agents, the mangroves and other coastal wetlands contribute to the improved health of neighboring aquatic environments. The wetlands’ ability to retain and absorb sediment and certain polluting agents led to the creation of artificial wetlands, specially designed to treat wastewater of various sources. Therefore, the size of the wetland and type of plants are adapted to the volume and type of rejected effluents. Wetlands are full of life. 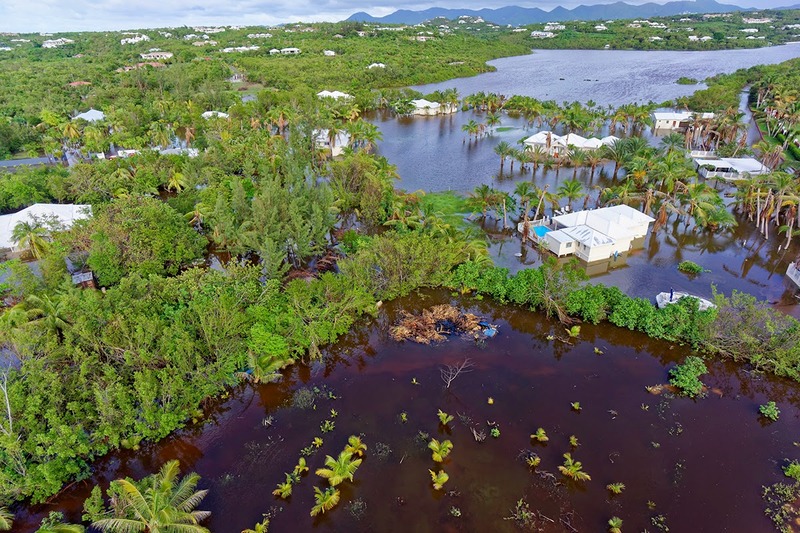 As concerns Overseas territories, several thousand species of mollusks, crustaceans, fish, birds, mammals, reptiles and insects rely on wetlands for part or all of their life cycle. There are a large number of endemic species. Mangroves are a real refuge for the young of certain fish species: tarpons, barracudas and sea pike are just a few examples. The young grow, protected by the maze of roots into which large predators cannot venture. Without this refuge, many coastal fish species would become endangered. Not only are wetlands the ideal place for birds to mate and reproduce, but they are also a perfect incubator and nursing site for nestlings to grow safely. They are also one of the key stop-over sites for a number of migratory birds who cross entire continents. A number of consumer products stem from wetlands: food, construction material, medicine, dyes, etc. The list is long. Among these products, some are collected in small quantities – for subsistence or traditional practices – whereas others are exploited commercially in larger quantities. The wetlands’ original landscapes and biological diversity make them top destinations in the tourism and leisure industries. Therefore, provided they remain reasonable and sustainable, activities such as recreational sailing, water sports, animal watching, hunting and fishing are long-term income sources for local communities. Wetlands may be considered sacred or evil, may be cherished or feared, but they have always spiked the interest of local populations and been the source of beliefs, legends and tales. 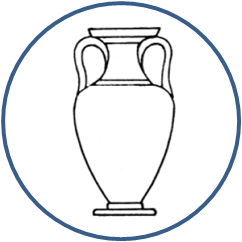 But these environments do not only feed our imagination, they also provide us with information about our past and are incredible sources of knowledge for archaeologists. Indeed, flooded soils and wetlands slow down decomposition processes due to the lack of oxygen. As a result, pollen, seeds, wood and materials are better preserved, and can sometimes be used to reconstruct part of a region’s natural or cultural history.